The SKULLCRAWLERS are a mysterious species to say the least. 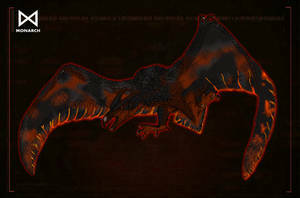 While arguably descendants of similar superspecies that shared the planet with the likes of SHINOMURA, these creatures seem to be unique to Pharaoh Island's volcanic ecology, although whether or not these kaiju exist in substantial numbers elsewhere has yet to be determined. Classified as "hypervores" by MONARCH scientists, these animals have a constantly active metabolism, meaning they are driven to consume endlessly. Humans, animals, even other Skullcrawlers are on the menu if they become hungry enough. It is theorized that the Skullcrawlers were in a state of semi-hibernation underneath Pharaoh until the events of 1962. When the MONARCH expedition arrived, they were quickly embroiled in the war between the SON OF KONG and the quickly multiplying reptilian predators. While Kong's species had more or less kept them at bay for centuries, the young Kong now found himself in an uphill battle. Unfortunately, MONARCH's arrival had coincided with the emergence of not just multiple Skullcrawlers, but also their "king," the Devil himself, which the Iwi named CHIROS, an ancient fire spirit, said to be a corrupted shaman who tried to become ruler of the Skullcrawlers, only to become one himself. Some conflicting reports name the monster "Ranmarak" or "Ramarak" but these have not been substantiated. In reality, "Chiros" may simply be an alpha genetically disposed towards being larger and stronger than the rest of the pack, not unlike bees and ants. Through the intervention of MONARCH, Kong was able to kill Chiros and protect the island from being overrun. But who knows if more Skullcrawlers still lurk deep within the Earth...and if they ever emerged in modern civilization, they would find no end of food to satiate their appetites. - Able to excrete superheated saliva, boiling temperature able to scald flesh in seconds. Oooh, yno, I bet for your Neo series, The Giant Octopus and the Mire Squid could be related. You could indicate that the Giant Octopus (Oodako) was a unique evolution of the Mire Squid that migrated into the sea and grew to an even more tremendous size while patrolling the waters surrounding the island. That way you could cover both bases by doing Oodako and simply say that smaller versions exist in the lakes inland. If the next one is Godzilla Herat could mix his story with the plot of the Toho Sazer-X series that implies an apocalyptic future. Do you plan to do Animations for YouTube with your Neo series? If not you should really think about doing that! I’d love to see it as a Netflix Anime. Or a video game. That would be awesome actually. Holy crap that looks awesome. Can't wait to see what you do with Godzilla Earth! Is Godzilla Neo supposed to be a comic series? I've seen the lore and everything but all I could find were these beautiful pieces of artwork. Oh, I thought he was going to do something like a fan series, Well I'm still happy with these nonetheless. Also, Toho should take these designs into consideration for there next film. They are that good. I loved that they were effectively Lindwurms, that made my dragon heart happy, lol. I hope this series never ends. Hanna Barbera series monsters or Tristar Godzilla cartoon monsters, or more of them, would be good. Earth Eater or Breeder Beast for one, or any odd kaiju from the Tristar cartoon. We will have series for time, between the MonsterVerse and the titans and if in the end Toho creates his shared universe of kaijus at the end of the MonsterVerse, this will be a non-stop for Godzilla Neo. So in theory they would give their own movies to different kaijus of the Godzilla saga. We had that before. It was called the Showa and Heisei series. Pfft, how are you gonna pull that off When Most of the Godzilla characters are used as obstacles for Godzilla, Face it, Godzilla's basically Batman. And not in a good way. From what I understand kaijus as Anguirus, Rodan, King Caesar and Mothra would have their own films that would connect with each other and Godzilla's. I also read that until they will give their own movie to Jet Jaguar, Kiryu and even King Ghidora! So were there even bigger crawlers that legends simply forgot about possibly? Humans are tiny but in sufficient numbers they killed a fair few kaiju. -How come the smaller variants have only three fingers and the bigger one four? -Bone Devils is alright, but what about Bone/Grave Serpents? -The smaller Variant design is okay but not very distinctive. -How does the armored skull act as a melee weapon? -Wouldn't a better way to describe their superheated saliva is a crude form of organic projectile napalm? Never thought about that. Then how does the armored skull act as a weapon? Ever heard of a Battering Ram? I have. Ever heard of a Triceratops or a Rhino? Man Love Those Skull Crawlers Creeps. I do hope we see more of these buggers in the movies! These look SOOO much better then the movie!